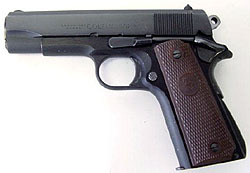 Between 1905 and 1911, the combined efforts of John Browning, Colt, and the Army Ordnance Board were required to produce the M1911 pistol, and this effort stood on the groundwork of several decades of autoloader development from Hiram Maxim, Hugo Borchardt, Herr Luger, the Mausers, and Browning himself. The M1911 fought its way through WW I and experienced some minor modifications, but beyond that, the Ordnance Board seemed to lose interest in further refinement of the M1911, and after WWII, began to search for a smaller caliber, and a lighter weight pistol with a smaller frame. Past 1926, design innovation of the M1911 was left to Colt, the armorers of the Army Marksmanship Unit, and talented civilian gunsmiths who applied their creativity and skill to the old warhorse. 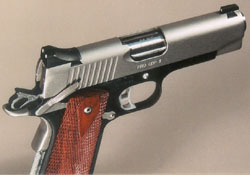 Through the shared experience of soldiers, lawmen, gunsmiths, metallurgists, competition shooters and others, a profile for the M1911 developed in the last half of the century: make it lighter, more accurate, smoother, better sights; bring back the longer trigger and flat mainspring housing of the M1911; make it able to handle modern hollowpoint ammunition reliably; give it a match grade trigger, and make it visually appealing. In the Pro CDP II, Kimber has done an excellent job of capturing this profile. While it is arguably the most successful autoloader pistol design in the world, the M1911A1 is not perfect (oooh, heresy… ). It’s big, heavy, has lousy sights, and in its military form, has marginal accuracy. (Kuhnhausen states that anything better than an 8” pattern at 50 yards was considered acceptable by government armorers.) These days, pistol shooters are demanding more out of their guns. It’s interesting to see how Kimber has addressed the criticisms of the M1911 in the Pro Carry and Pro CDP series of pistols. The first major design innovation made by Colt to the venerable 1911 formula was in 1949-1950 when the aluminum alloy framed Commander was introduced. Colt did this in response to the Armed Forces’ quest for a smaller, lighter sidearm. Although the Commander was not adopted by the military, the format proved to be immensely popular. At 28 ounces, the Commander was considerably more comfortable to carry than the Government Model. 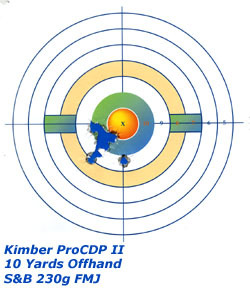 The Kimber Pro CDP is a Commander-format gun. It has the aluminum alloy frame and Government-size grip of the Commander. Its slide and barrel are 1/4″ shorter than the Commander, and it uses a 4″ bull barrel rather than the 4.25″ barrel with bushing of the genuine Commander. The Commander format makes for a gun that is very easy to carry but still large enough to have excellent accuracy and adequate muzzle velocity. Kimber made their mark in the M1911 pistol world by offering guns that had all of the “custom” features that people had been adding to their guns for years: extended beavertails, non-snag combat sights, extended ambidextrous thumb safeties, etc. The Pro CDP has every custom nicety that you can think of for a custom M1911. “CDP” stands for “Custom Defense Package” in Kimberese. These guns are hand fitted in the Kimber custom shop and have a distinctive look. The frames have a black anodized finish. The slides are bead-blasted stainless steel with a “melt treatment” meaning that the sharp edges are rounded off. The CDP pistols also feature Meprolight tritium night sights and ambidextrous thumb safeties. The grips are rosewood. The small parts – the slide stop, grip safety, grip screws, hammer, mag catch, and thumb safety – are stainless steel to contrast with the flat black of the frame. The mainspring housing is silver colored plastic and the trigger is aluminum. For some, including me, this visual treatment is a bit flashy, but it does create an eye-catching effect. Kimber has begun to install what they call the “Series II” firing pin block. (It is essentially a resurrection of the Swartz safety developed for Colt before the Second World War). 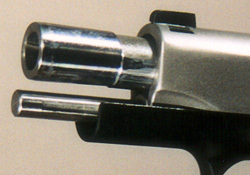 When you depress the grip safety, a small pin pushes a plunger up in the slide which unblocks the firing pin. I do like it better in one respect than the Series 80 firing pin block of Colt: it is activated by the grip safety, not by the trigger (see diagram), so you get the clean trigger pull sans the click and crunch of the Series 80 guns. You have to be careful when you field strip it and reassemble it because if you hold it by the grip and activate the grip safety, a little pin comes up next to the disconnector and it will stop the slide from coming off or going on, and if you get muscle-bound with it, you could shear the pin and render the gun unable to fire. Also, the FPB mechanism can only be accessed by removing the rear sight should you need to do cleaning or maintenance on it. I’m not terribly wild about this characteristic. (I still believe this is a lawyer-friendly answer in search of a question. I continue to search for documented instances of 1911 pistols going off from being dropped on their muzzles, and I have yet to find one documented instance of an unmodified 1911 in good repair discharging due to a drop on the muzzle from any kind of normal height – if you find one, please send it to me). One of the persistent complaints about the M1911 pistol is that the venerable Government Model would only feed 230 grain full metal jacket “hardball” ammunition. The Government Model and the hardball cartridge were literally built for each other. The development of the cartridge was part of the development process of Browning and the Army Ordnance board. The original M1911 and M1911A1 pistols are tremendously reliable with the hardball cartridge. The problem emerges when shooters want to run other types of ammo, particularly wadcutters and hollowpoints that don’t follow the hardball profile. The traditional solution for this problem is to throat the barrel and hope for the best. Kimber seems to have conquered this problem for the most part on their defensive models. The barrel is given a wide throat at the factory, and, if you compare the feed ramp of the Pro CDP with the feed ramp of a Series 70 Colt, you will notice that the Kimber feed ramp is cut at a deeper angle than that of the Colt. The Pro CDP has shown superb feed reliability. This gun just hasn’t jammed or failed to feed at all. A common complaint levied against the 1911 is that it’s designed for right-handers and is not south-paw friendly. This is mostly true: the thumb safety and magazine release are on the left side of the gun and are intended to be operated with the thumb of the right hand. Those of us who are devoted to the 1911 pattern learn to operate the controls of the 1911 with either hand, but many find the left hand operation of the manual safety to be awkward and difficult. The user must bring the thumb around the beavertail while holding the grip only between the palm of the hand and four fingers. This is not a secure hold and may be difficult for users with small hands. Kimber’s response to this issue is to install an ambidextrous thumb safety in the CDP line of pistols. 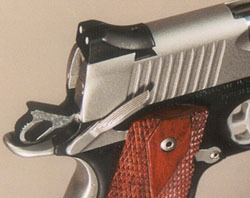 The magazine release remains on the left side of the frame only, but south-paws can work the mag release with less awkwardness than the left handed operation of the thumb safety. The index finger on the mag release works well. Another common and well justified critique of the Government Model M1911 is that the sights are too small and hard to see. Thin front sight blades and narrow rear sight notches make for more precision in high accuracy target work, but a thicker front sight post and wider rear notch make for quicker target acquisition. The wider leaf and notch are also easier to see for those with weak eyesight. Remembering that “CDP” stands for “Custom Defense Package,” The Pro CDP employs the wider notch and leaf McCormick-style “combat sights” with Meprolight tritium insets for quick low-light target acquisition. It’s interesting to point the gun down a darkened hallway to see how far off our basic intuitive pointing of the gun can be. It’s instructive. I like these sights. Somewhat more controversial is the full length guide rod employed by Kimber and many other 1911-clone builders. M1911 purists are fond of quoting the old saw, “the berm at Gunsite is littered with full-length guide rods.” The M1911 and Colt Commanders have partial-length guide rods. The partial length guide rod reduces the weight of the gun and enables the trigger-guard-and-spring-plug press check. Proponents of the full length guide rod say the FLG gives more consistent lock-up and better reliability. This is one of those debates that is interminable, like .308 vs. 30-06, but the fact is that most pistol builders, including those building 1911s have adopted the FLG. The Pro CDP uses a FLG. 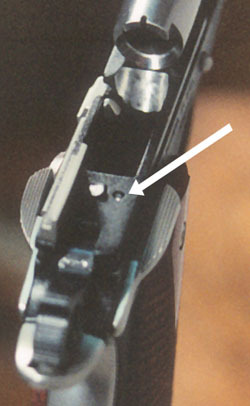 The slide is disassembled by trapping the recoil spring with a small wire tool that comes with the gun. When you lose the tool, and you will, you can easily replace it with a paper clip straightened and bent into an “L” shape. The Pro CDP sports another evolution away from the classic Browning design: it eliminates the barrel bushing in favor of a bull barrel. This innovation isn’t new with the Pro CDP. 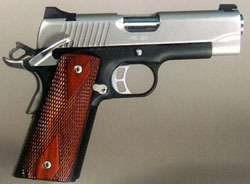 Kimber started using it with their Compact model. Bull barrels aren’t new either. Karl Schuemann has been building them for many years and they have been used in pistols from Clark Custom, Para-Ordnance and many others. For maximum accuracy and reliability, the barrel bushing of the M1911 should be hand fitted by an expert. Eliminating the bushing simplifies the design and removes one thing that can be a source of problems. Is the bushing-less design superior? For guns with barrels of 4″ or less, I think it is. Commanders and Government Models seem to function pretty well with bushings, but smaller guns do seem to benefit from the bushing-less design. The compact Kimbers with bull barrels that I have tested have been wonderfully accurate and reliable. Accuracy of the gun is quite rewarding (see test target). I find it easy to put the bullets where I want them to go with excellent consistency. No complaints here. The trigger is OK, but not great. It is 4.5 lbs. with a little bit of creep. It will smooth out with some use, but I think a “Custom Shop” gun could be a bit cleaner. With an MSRP of $1140, the Pro CDP is not cheap. 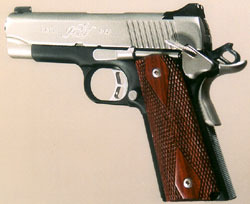 Kimber claims that by installing all of the “custom” features at the factory at production time, the user is saved $500. When Kimber first began to provide factory guns with custom features, this was certainly true and the Kimber Custom was far and away the best value in factory produced 1911’s at that time, especially if you wanted the standard package of custom features on a Government Model pistol. These days, with Springfield Armory, Colt, Para-Ordnance, and most other manufactures building the standard custom features into their guns at production time, the added value pitch is not as persuasive as it once was. The Pro CDP is a beautifully built pistol, but I would like it better at a price point between $800 and $900. This is the place where I have the most ambiguous feelings about this gun. If your aesthetic for guns and gear is tactical flat black, you won’t like this pistol. If, on the other hand, you like a little flash, this pistol will speak to you. One of the delightful characteristics of the 1911 is that it does lend itself to interesting custom finishes and visual effects. 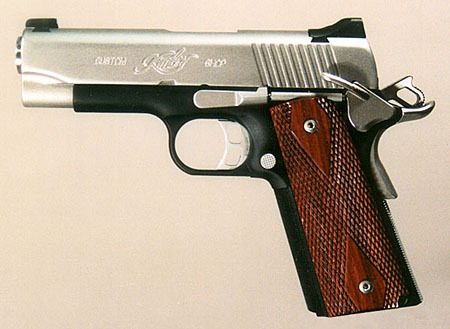 The high-end custom shops, like Clark, Wilson and Brown, have been producing two-toned 1911s for a number of years, and it’s an eye-catching effect. The contrasting and alternating tones of black and stainless components create a visually interesting effect. The vibrant orange-red color of the grips completes the visual impact, placing a warm and moderating tone between the stark black and silver colors. This styling has been grabbing my attention in display cases since Kimber first introduced the CDP line of pistols. It’s an attractive pistol, but I haven’t bought one for myself. It’s just a bit too flashy for me. Really, my favorite “look” is the “I’ve fought my way through a dozen wars and I’m better than ever” look. While it is true that I have definitely acquired “champagne tastes” in 1911 pistols and my complaints are tiny things that a thousand others wouldn’t even notice, a couple of things really bothered me. I could see a slight sliver of daylight under the ejector and under the front sight base (we’re talking jeweler’s loupe stuff here, not big gaps). Both parts are firmly attached to the gun, and will probably never cause a problem, but for a $1140 “Custom Shop” gun, I should not see any space under these parts. It would really annoy me to see the front sight flying away at some point in the future. The checkering on the grips is coarse and sharp, not really comfortable. I think a finer checkering should be used. The mainspring housing is gray plastic. I don’t have the problem with the plastic MSH that some people do – they reduce weight, don’t rust, and are actually kinder to your hand than a steel one – but this one looks cheesy. I like the Meprolight tritium night sights. They’re bright and they really would assist in getting the gun oriented in a night time defensive situation. I like the 30 lpi checkering on the front strap and bottom of the trigger guard. The weight is great. It feels much like a Lightweight Commander, but even lighter. I put a full mag in and holstered it. The comfort brought about by the reduced weight is immediately noticeable, especially in the holster. Slide to frame fit is excellent. I haven’t made up my mind about the melt-down treatment, but a lot of people seem to like it. Trigger and accuracy were excellent right out of the box. Reliability is typical of Kimber: it runs right straight out of the box with any kind of ammo you feed it. The Kimber Pro CDP II is a pistol I would feel perfectly comfortable in carrying in the defensive role or for use in a tactical match. It is a visually appealing pistol with superb accuracy and rock-solid reliability. Its heritage proceeds from the Colt Lightweight Commander, and its design reflects 90 years of learning and experience with the M1911 single action autoloader design.